NCP Nursing Care Plans For Meningococcal Infections. 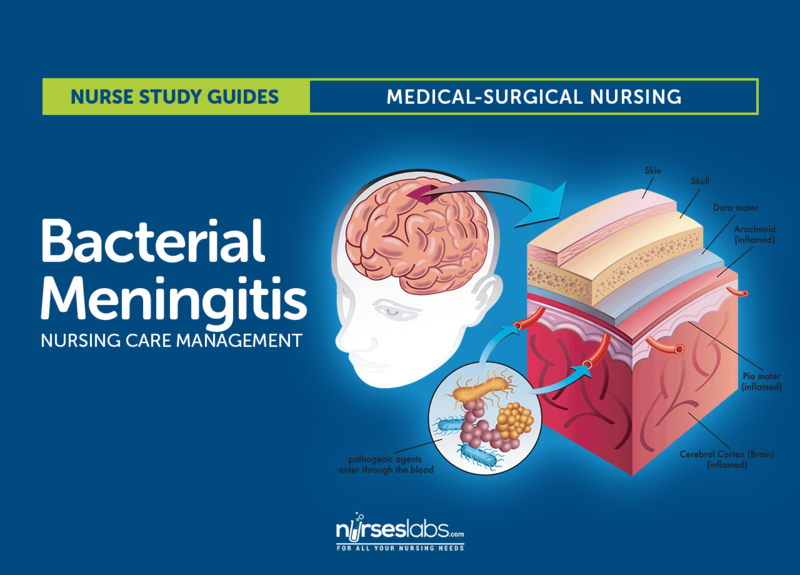 Two major meningococcal infections, meningitis and meningococcemia, are caused by the gram-negative bacteria Neisseria meningitidis, which also causes primary pneumonia, purulent conjunctivitis, endocarditis, sinusitis, and genital infection. Meningococcemia occurs as simple bacteremia, fulminating meningococcemia and, rarely, chronic meningococcemia. It commonly accompanies meningitis. Meningococcal infections may occur sporadically or in epidemics; particularly virulent infections may be fatal within a matter of hours. Hemorrhage GI tract, and urinary tract, as well as tissue ischemia. Septic arthritis, pericarditis, or endophthalmitis. Aspiration of the organism can cause meningococcal pneumonia. Meningococcal infections may progress very rapidly, causing neurologic deterioration and even death. Features of meningococcal bacteremia include sudden spiking fever, headache, sore throat, cough, chills, myalgia , arthralgia, tachycardia, tachypnea, mild hypotension, and a petechial, nodular, or maculopapular rash. Headache and stiff neck can also occur as the infection extends to the meninges. Characteristics of the rare chronic meningococcemia include intermittent fever, rash, joint pain, and an enlarged spleen. The patient will express feelings of comfort and relief from pain. The patient will maintain adequate cardiac output. The patient will remain a febrile. The patient's skin will remain warm, dry, and intact. The patient will exhibit healed or improved lesions or wounds. The patient's ventilation will remain adequate. The patient will maintain collateral circulation. The patient will remain hemodynamically stable.